With a focus on helping customers work smarter by lowering operational costs and increasing efficiencies, Joy Global is highlighting its smart material handling solutions at Booth C31011 at CONEXPO-CON/AGG 2017 this week in Las Vegas. 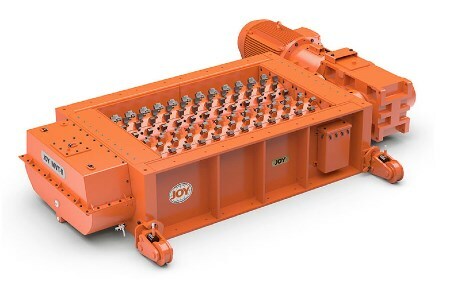 Flexible, low-profile and mobile Joy surface feeder-breakers that reduce mine material handling costs by reducing haulage distances and site preparation. Mobile Joy reclaim feeders that blend materials, reclaim stockpiles, and feed materials cost effectively. Joy MVT-II’s matched velocity technology to reduce fines generation. Roll speeds are set to match the velocity of material falling through the sizer and reduce material fines. High angle conveyor (HAC) systems that increase truck utilisation and efficiencies in many quarry and pit material handling operations. In-pit and overland conveyor systems able to negotiate varied terrain, including horizontal and vertical curves. These advanced systems and products build on the history of Joy Global’s legacy brands including Continental Conveyor, Goodman-Hewitt and Stamler to offer customers a wealth of experience in material handling.